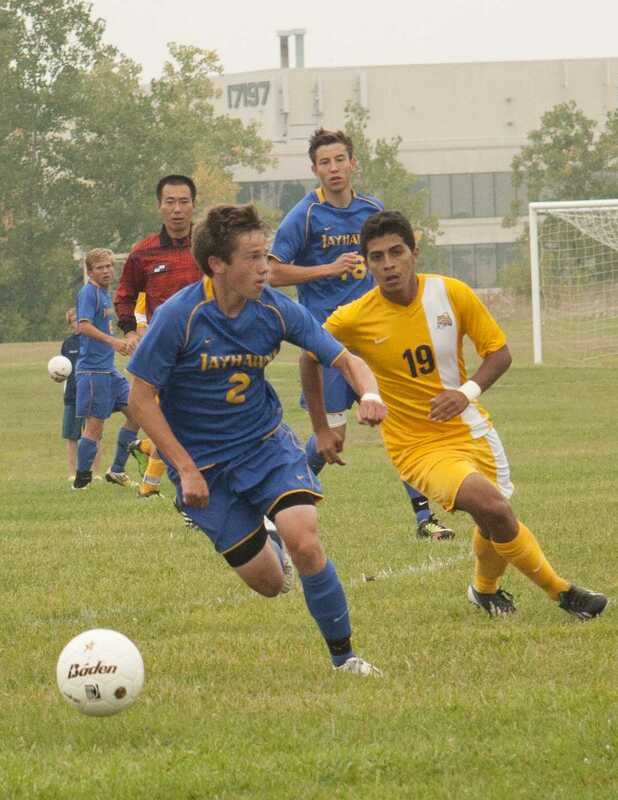 Entering the 2013 season, expectations were high for the Men’s Soccer team. The team entered the preseason ranked ninth in the National Junior College Athletic Association Division II preseason poll. The Ocelots, who won the MCCAA Championship last season with an overall record of 15-3-1, created quite the buzz as the season began in August. Schoolcraft midfield Vincente Jaramillo chases Muskegon’s Kyle Wansten. Photo by Lindsey Wells. Unfortunately, the buzz would be tempered early on, as the Ocelots dropped four of their first six games – including two overtime heartbreakers. A team that had begun the year ranked in the top ten of the NJCAA preseason poll found itself teetering on the brink of disaster less than a month into the new season with their sluggish start. Any great team knows that adversity will inevitably rear its head at some point during the season, and the way in which a team responds to those difficulties will ultimately determine whether the season is a success or a failure. There were two choices facing head coach Rick Larson and his team as they found themselves staring down the standings at 2-4: pack it in and call it a year, or answer the bell. Needless to say, the Ocelots chose to start living up to their preseason hype. Showing grit and character customary of true competitors, the team reeled off six straight victories in dominating fashion, including a 9-2 throttling of Cuyahoga College. “Started out a little rough, but it’s starting to come together now,” team captain Victor Ammons said. Ammons pointed out that the bond he and his teammates have developed is the biggest reason for their midseason surge, another telltale sign of a great ballclub. “The guys are starting to get to know each other a lot better…and [head coach] Rick [Larson] has been doing some good training drills to really get us connecting with each other,” Ammons said. The Ocelots have outscored their opponents by 19 goals, dating back to the start of their winning ways in mid-September and have put together a six game winning streak as of October 6. Although the team and its devoted fanbase could not have been thrilled with the start of the season, the team can be proud of the turn-around have made and, of course, the ever-growing win total. Ammons describes a successful season as finishing on winning streak. Given the incredible performance level of late, the Ocelots could be peaking at the right time and are poised to have another successful postseason.